Are you from another state, or even another country, but you still wish to get married in NYC? No problem! New York has no residency requirement for marriage, so NYC is the perfect “destination wedding” location. I have married many couples from out of state and from other countries, including Australia, Belgium, Canada, China, Ecuador, France, Germany, Ireland, Japan, Luxembourg, Sweden, Trinidad & Tobago, and the UK (England, Scotland and Wales). There are only three requirements for your New York City Destination Wedding: You must get a valid marriage license 24 hours before your ceremony. You must have a witness for your ceremony. 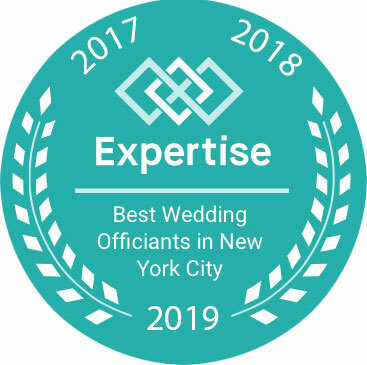 Your Wedding Officiant must be registered with the City of New York. Everything else is up to you. You can have a religious, a secular or a civil ceremony. 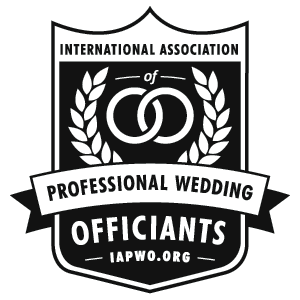 You can exchange traditional, personal, or no vows at all. You can wear a gown, a tuxedo, or a t-shirt and jeans. You can hold your ceremony in Central Park, Times Square, or your special NYC spot. So indulge your Big Apple fantasies, and enjoy all that New York City has to offer while you are here! You must obtain a Marriage License at the City Clerk’s Office, in person, together. You can apply for a Marriage License online, but you will still need to go to the City Clerk's office together, with valid identification, to complete the process. The online application is valid for 21 days before it expires. If you don't make it to the Clerk's office in that time, you can reapply online. We recommend that you take advantage of the online system, as our couples who have used it report speedy service from the Clerk. The marriage license currently costs $35. The City Clerk’s Office IS NOT OPEN ON WEEKENDS OR HOLIDAYS. Please remember that when you are making your travel plans. THERE IS A 24 HOUR WAITING PERIOD from the time you receive your License to the time you may wed. Please keep that in mind, too, when making your travel plans. Also, Licenses expire after 60 days. Couples from New York State outside of the Five Boroughs: Since marriage licenses are issued by Town and City Clerks on behalf of New York State, any license issued within the State is valid in New York City. It's perfectly all right to get the license in your local jurisdiction if you find it more convenient. 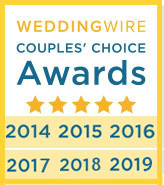 Couples from out-of-state or from abroad: As the Manhattan location of the City Clerk's office has more experience with their specialized needs, our out-of-state and international couples have strongly recommended that you get your marriage license there. The Manhattan City Clerk's Office is located downtown at 141 Worth Street. The Marriage Bureau is located on the first floor to the right as you enter the building and is open from 8:30 AM to 3:45 PM. Lines can be long, especially on Fridays during popular wedding months, so we recommend that you get there early. If you're taking a taxi or other car service, tell the driver the address and that the Clerk's office is on the northeast corner of Centre and Worth Streets. If you want to travel like a New Yorker, you'll take the subway. The concierge at your hotel can tell you the nearest subway entrance. The nearest stations to the Clerk's office for each subway line are listed below. Click on any subway line for the line map. Click on any station name for walking directions to the City Clerk's Office from the station. You need to have a wedding ceremony for your marriage to be legal. 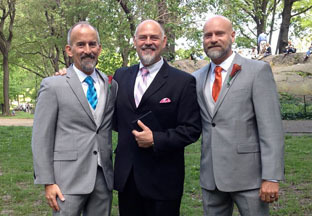 The minimum legal requirements for a ceremony are that it takes place at least 24 hours after your license is issued, that you both verbally consent to enter into a marriage, that you have one witness who is at least 18 years old, that your wedding officiant is registered to perform marriages with the City of New York, that you, your witness, and your officiant all sign your marriage license, and that your license is filed with the City of New York within 5 days. 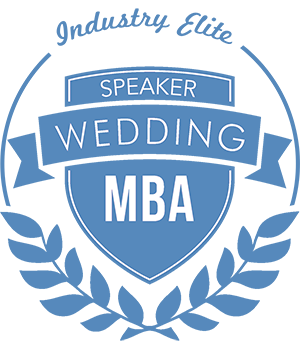 Everything else that happens at your ceremony is up to you. You will be legally wed as soon as the ceremony and paperwork are completed, but you will NOT receive a Certificate of Marriage right after your ceremony. 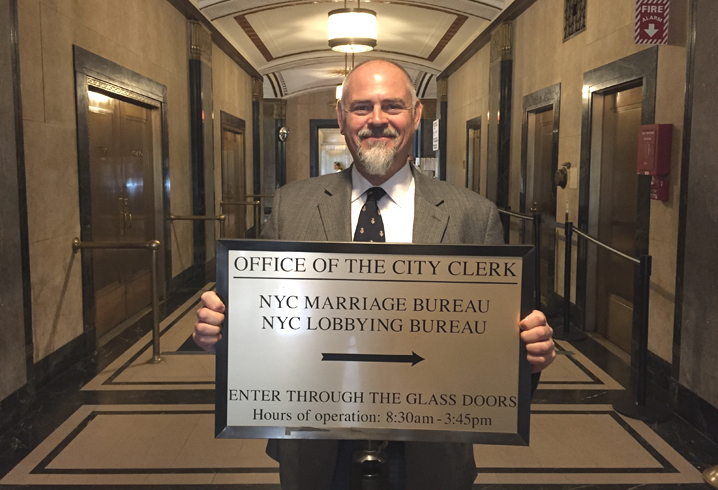 As your Wedding Officiant, I will file your signed and completed Marriage License with the City of New York after your wedding ceremony. The law requires that I do this within 3 days, but I usually do it that same day. Usually, it takes about two weeks for the documentation to be sent to you from the city. Couples that need their documentation immediately: If for any reason you need your Marriage Certificate more quickly than the City's normal processing time, one of you may bring your signed and completed Marriage License and valid identification to the City Clerk's Office after your ceremony. Marriage Certificates can only be issued to a married spouse, so your Wedding Officiant cannot expedite the issuance of a certificate for you. Couples from abroad : Please be aware that Certificates of Marriage are issued in multiple forms. The extended form for foreign use costs $35. Please check with your local government which form you will need to register your marriage in your home country before you visit the City Clerk.